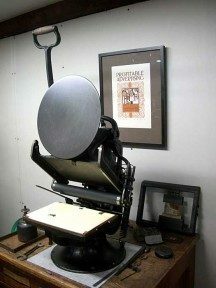 The Golding Map press in its open position. Its platen does not move; instead, the bed moves down to the platen. William Golding made a variety of different press styles over the years before ending production in the 1920’s. The Official No. 9, also known as a Map press because it could be used to print on small areas on larger sheets of paper (such as a map), was one of Golding’s most unusual presses. At first glance it may look similar to the 6 x 9 Official No. 4. But unlike the other Golding Official presses, and nearly all platen presses, its platen does not move. Instead, the bed moves down to the platen. Because of this unusual maneuver, a screw is needed to hold the ink disc in place. This screw is unnecessary in most presses where the ink disc does not move to a vertical position. Golding also made a larger Map press model (No. 12) which had a chase size of 8-1/4″ x 12-1/2″ as well as a very unusual tabletop Map press with a flywheel called the Imprinter in the same 8-1/4″ x 12-1/2″ size.